Published by Bupa's health information team, June 2009. This factsheet is for people who have deep vein thrombosis (DVT), or who would like information about it. 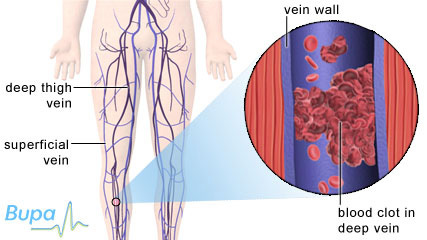 Deep vein thrombosis (DVT) is a condition in which a blood clot forms in one of your deep veins, usually in your leg. DVT can cause pain and swelling and may lead to complications such as pulmonary embolism. DVT happens when a blood clot forms in a deep vein. DVT is most common in the deep veins of your lower leg (calf), and can spread up to the veins in your thigh. DVT can also first develop in the deep veins in your thigh and, more rarely, in other deep veins, such as the ones in your arm. Deep veins pass through the centre of your leg and are surrounded by a layer of muscle (see diagram). When blood clots form in the superficial veins, which lie just under your skin, the condition is known as superficial thrombophlebitis. These superficial blood clots are different to DVT and are much less serious. Many blood clots that cause DVT are small and don't produce any symptoms. Your body will usually be able to gradually break them down with no long-term effects. Although not necessarily a result of DVT, if you have these symptoms you should visit your GP. DVT may not cause you any further problems, but possible complications can include the following. This is the most serious complication of DVT. A pulmonary embolism happens when a piece of the blood clot from a DVT breaks off and travels through your bloodstream to your lungs, where it blocks one of the blood vessels in your lungs. This is serious and in severe cases, can be fatal. See Related topics for further information. This is something that happens if DVT damages the valves in your deep veins, so that instead of flowing upwards, the blood pools in your lower leg. This can eventually lead to long-term pain, swelling and, in severe cases, ulcers on your leg. This is a rare complication that only happens in a very extensive DVT. Because of the blood clot, the pressure in your vein can become very high. This can block the flow of blood through your arteries, so less oxygen is carried to the affected leg. This can be painful and lead to skin ulcers, infection and even gangrene. There is evidence that long-haul flights (lasting over four hours) can increase your risk of developing DVT. The risk is mainly the result of sitting down for long periods of time, which can happen during any form of long-distance travel, whether by car, bus, train or air. It's difficult to say whether the travelling itself directly causes DVT, or whether people who get DVT after travelling are at risk for other reasons. Generally, your risk of developing DVT when travelling is very small unless you have at least one of the other risk factors mentioned above (such as a history of DVT or cancer). If this is the case, you should talk to your GP before you travel on a flight of more than four hours. Your GP will ask about your symptoms and examine you. If he or she thinks that you might have a DVT, you may be referred to a specialist. You may have the following tests in hospital. A blood test called a D-Dimer. This measures a substance which develops when a blood clot breaks down. If this is negative it's unlikely that you have a DVT. A Doppler ultrasound. This is a test that uses sound waves to look at your blood as it flows through your blood vessels. It's the best test to detect blood clots above your knee. A venogram. In this test, a special dye is injected into your vein, which shows up the vein on X-ray. This is the best way of showing clots below your knee. Anticoagulant medicines are the standard treatment for DVT. They change chemicals in your blood to stop clots forming so easily. Anticoagulants include heparin and warfarin. Anticoagulants can stop new blood clots from forming and old ones from getting any bigger. They can't dissolve clots that you already have - your body will do that itself over time. Thrombolytic medicines are medicines that work by dissolving blood clots; but they can cause bleeding and so are rarely used to treat DVT. These are also called graduated compression stockings. Your consultant may ask you to wear these to ease your pain and reduce swelling, and to prevent post-thrombotic syndrome. You may need to wear them for two years or more after having a DVT. Ask your GP for advice if you think you're at risk of developing a DVT. There are a number of things you may be able to do to reduce your risk, such as stopping smoking if you smoke, or losing weight if you're overweight. Regular walking can help to improve the blood circulation in your legs and help to prevent another DVT from developing. There is no good evidence that taking aspirin reduces your risk of developing DVT. Surgery and some medical treatments can increase your risk of developing DVT. So, if you're going to hospital for an operation, you will usually have an assessment to check your risk of developing DVT before you have your operation. There are many things that can be done to keep your risk of developing DVT during surgery as low as possible. You may be given anticoagulant medicines before and after surgery, or be asked to wear compression stockings. You may also be given a mechanical pump to use on your feet and legs in the first few days after the operation. This is called an intermittent compression device. The pump automatically squeezes your feet and lower legs to help your blood circulate. If your GP has told you that you're at high risk for DVT (for example, if you have a previous history of DVT or a blood clotting disorder), you may need heparin injections as well for flights longer than four hours. Talk to your GP or haematologist for more information. If you develop swelling or pain in your calf or thigh, or if you have breathing problems or chest pain after travelling, you should seek urgent medical attention. This information was published by Bupa's health information team and is based on reputable sources of medical evidence. It has been peer reviewed by Bupa doctors. The content is intended for general information only and does not replace the need for personal advice from a qualified health professional.